The Boley Rodeo and BBQ is arguably Oklahoma’s biggest black town attraction that occurs every Memorial Day weekend. The 100-year old festival hosts a parade and sporting event—the rodeo—while celebrating Boley’s history as a space of black self-sufficiency, social progress and economic vibrancy during the Jim Crow era. In this talk, Slocum will focus on the parade, the weekend’s kick-off activity when an array of black-identified groups from across Oklahoma and parts of the Midwest join the procession down Boley’s main strip. Spectators watch cowboy and cowgirl clubs, lowrider associations, high school marching bands, biker clubs, little leaguers, and Greek organizations all on display. 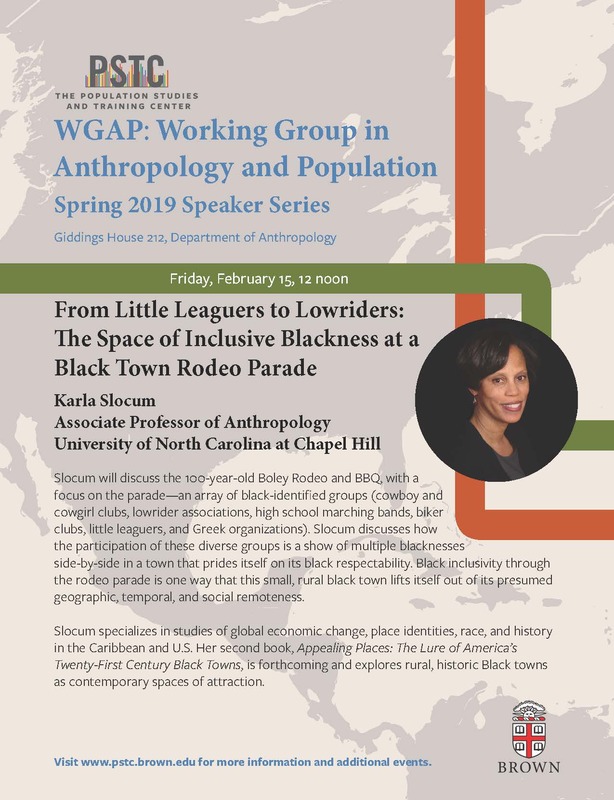 She will discuss how the participation of these diverse groups is a show of multiple blacknesses side-by-side in a town that prides itself on its black respectability. She argues that this broad public profiling of blackness beyond black respectability positions black towns as inclusive spaces. Black inclusivity through the rodeo parade is one way that this small, rural black town lifts itself out of its presumed geographic, temporal, and social remoteness. Slocum is the Thomas Willis Lambeth Distinguished Chair of Public Policy, Associate Professor of Anthropology and Director of the Institute of African American Research at the University of North Carolina-Chapel Hill. She specializes in studies of global economic change, place identities, race, and history in the Caribbean and the United States. Slocum is the author of Free Trade and Freedom: Neoliberalism, Place and Nation in the Caribbean (University of Michigan Press, 2006). Her second book, Appealing Places: The Lure of America’s Twenty-First Century Black Towns, is forthcoming with the University of North Carolina Press and explores rural, historic Black towns as contemporary spaces of attraction. Slocum has published articles and book chapters in such journals and edited volumes as American Anthropologist; American Ethnologist; Souls: A Critical Journal of Black Politics, Culture, and Society; Transforming Anthropology; and the Routledge Companion on Inter-American Studies. She is the recipient of the Academic Excellence Award from UNC-Chapel Hill’s Institute for the Arts and Humanities, and she has also been awarded fellowships from the National Science Foundation, the National Endowment for the Humanities. the School for Advanced Research, and the Woodrow Wilson National Fellowship Foundation.